When it comes to gaming headsets, there are really only a handful of names out there that are really well known throughout the community. One of them is Steelseries. Steelseries has been cranking out professional grade gaming hardware since the early 2000’s, including keyboards, mice, mousepads, and headsets. What I’m mainly interested though from them are their gaming headsets which I’ve been using since 2013. My first experience with Steelseries was with their Steelseries Flux In-Ear Pro headsets and throughout the years included the H-Wireless, the P300, and the Siberia 200. Their latest headsets though have me blown away not only with their superb audio quality and construction, but because they are so darn affordable. The one I’m looking at today is the Arctis 7 which is part of Steelseries’ newest lineup which also includes the Arctis 3 and Arctis 5. 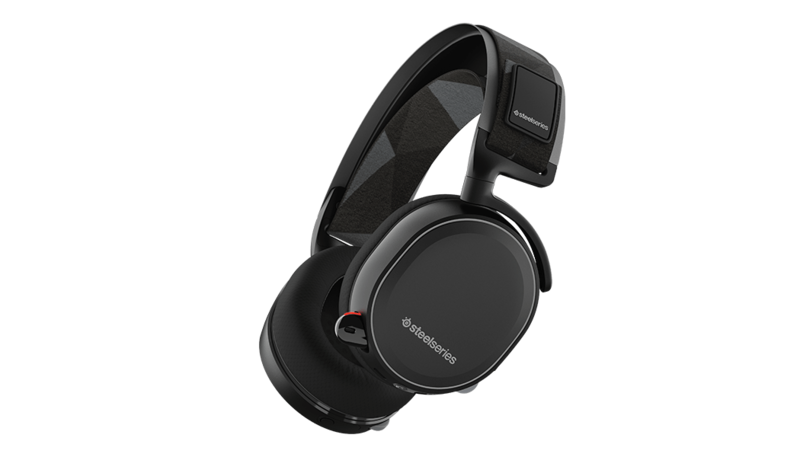 The Arctis line is a completely new direction Steelseries is taking with headset designs. In the past, their headset designs stayed relatively the same and there wasn’t really too much of a difference in terms of looks between their lower end headsets and their high end ones. This changes with the Artcis because these look nothing like their past designs. The Arctis 7 that I’m looking at is the top tier headset in the line. 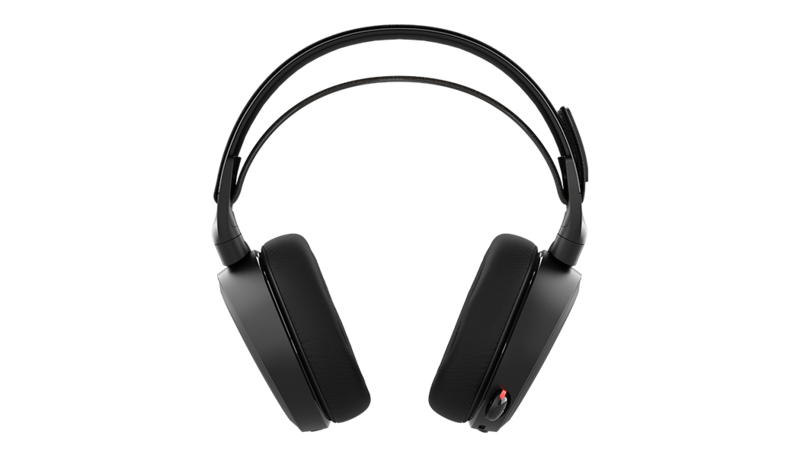 The difference between this one and the others is that the Arctis 7 has built in, lag-free wireless, has DTS Headphone:X 7.1 Surround Sound, and the design of the headband is slightly different. Other than that, if you need a more affordable solution, can can go with the Arctis 3 and still be perfectly happy with them as they also contain many of the features the Arctis 7 has. Steelseries is known for their self adjusting suspension headband and while the Arctis 7 accomplishes this in a different manner, it still works relatively the same. By using a new ski goggle headband that is both flexible and attractive, the Arctis 7 is able to adjust to all manners of head shapes. What’s neat about this new system is that you’re now able to replace the headbands with new designs. For now, there’s only a handful of designs available, but if all goes well, there will be a lot more to choose from. For those who want to be extravagant, there’s even a pretty sick looking leather headband you can get that makes the Arctis 7 look even more luxurious than they are. The Arctis 7 is certainly more solid and better made than some of their previous headsets. While many of the older headsets used materials to keep the weight down, they often felt a little bit too flimsy. They were super comfortable but I always felt like I was going to break them.That’s not the case with the Arctis 7. The actual headset band is made of metal and is rather flexible, but never loses its shape. It has just the right amount of tension where they aren’t too loose and aren’t too tight on your head. When you combine this with the elastic ski goggle headband, it creates a perfect fit that never needs adjusting. It all just works really well. Ear cups on the Arctis 7 are also very nice. They are over the ear units that actually fit over my entire ear. They feature AirWeave ear cushions to keep you cool, dry, and comfy. I’ve worn them for long periods of time and they are one of the few headsets so far that don’t make my ears feel all sweaty. They also passively block out a good deal of outside noise. What I do like is that all the controls are located on the ear cups. The volume control, the audio mixer, and the mute button are all in easy reach. I also like how the microphone is stowed away in the headset and when you need to use them, just pull them out. No need to disconnect them or flip them out of the way. The only issue you might have with these headphones is that you do need a special receiver to use them on your gaming console or computer for wireless. These aren’t Bluetooth headphones. The receiver is a tiny little thing that sits out of the way and doesn’t do anything else other than to connect the headset to the source. That means if you want to use the Arctis 7 on your mobile phone or portable gaming console, you’ll need to connect the included cable them and plug it into your device. On the plus side, you will not need to turn on the headphones to use them this way. I’ve mainly been using the Arctis 7 on my PlayStation 4 and let me tell you, these things sound amazing. The big draw here is 7.1 Surround Sound which means you can hear EVERYTHING that goes on in your game and what direction those sounds are coming for. That means terrific spacial awareness when playing games like first person shooters which can be the difference between getting a kill or getting killed. And while the Arctis 7 sound great with gaming audio, its the chat audio that is really impressive to me. For some reason, these relay the clearest chat audio I’ve ever heard. When my buddies are talking to mean in party chat, I’ve never heard them so loud and clear. It’s an odd feeling but one that is very appreciated, especially when playing games that require good communication. The mic on the Arctis 7 also seems very good. I asked several of my friends I was testing the headset with and they all said I sounded crisp and clear on the other end. The only issue was that my volume was a little low which was easily fixed by adjusting the volume in the settings on the PS4. I think the main plus here with the mic is the use of Steelseries’ ClearCast microphone which uses an exclusive bidirectional design. One mic faces your mouth while the other mic faces in the opposite direction to help cancel out background noise. While it doesn’t completely cancel out all the noises, it does a great job decreasing it to where they won’t become a distraction. In terms of comfort, design, and audio quality, that’s a no. In these areas, the Steelseries Arctis 7 excels and is one of the best gaming headsets I’ve used, especially at the price. For the features that the Arctis 7 has and the fact that these are compatible with multiple different platforms, the asking price for these seems about right. The only real negative I can find is that you can’t use these wirelessly with everything. It doesn’t have Bluetooth and relies on the little wireless dongle for it to work wirelessly. That means it only works on a gaming console or your PC. I talked a bit about that earlier in the review. The Steelseries Arctis 7 is one of the best gaming headsets I’ve used. While the top of the line Siberia 800 series is at the tippy top of that list, it’s just too expensive for your average gamer. The Arctis 7 is more affordable has many of the same features and hardware that the more expensive headset has. The only difference I think is the lack of an interchangeable battery and it doesn’t have that nifty game mixer. But for the price, you get a great wireless headset that sounds terrific and has a battery that lasts for a fairly long time per charge. While the Arctis 7 isn’t the top of the line Steelseries headset, they sure feel like it. 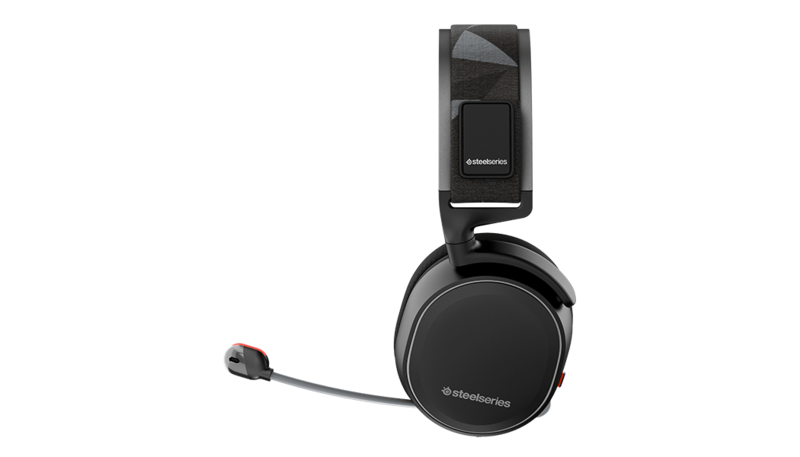 The materials used and the new removable ski google headbands make the Arctis 7 look and feel fantastic and coupled with the amazing audio quality, Steelseries has a winner here.